Now everything seems fine and dandy and its time to make our first Django project. Well, say hello to Windows bugs! 1.-Execute the BitNami Django Stack Manager tool and the Use BitNami Django Stack Console application. 3.-If you check using the "dir" command on the console you should see the mysite directory within the DjangoTest one. *Python can't import the Django package. According to what I read it wasn't the problem as Python automatically comes linked with the Django installer (version 2.7.5 in my case) but in case the import Django command on the console gives error, you can try adding the directory where Django is installed on the PythonPath as shown here. 1.-Basically check if Python can recognize the import Django command in the BitNami Console as shown in the figure. 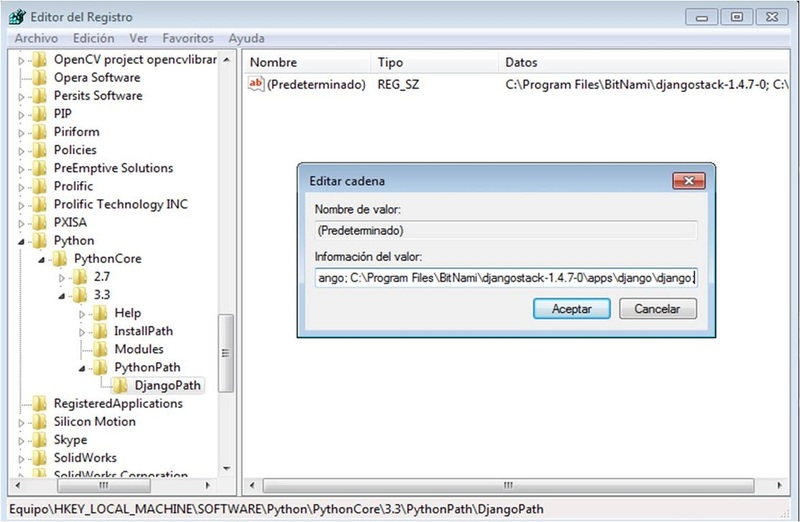 *Typing "python" will show the version and initialize the version installed in the BitNami module. *Typing "import django" must return nothing if its correctly installed. 2.-If it shows something like "import error django not found" you can go to START and type Regedit. This will open the Registry Editor with all the keys the system uses. BEWARE its delicate data so don't mess with it too much if you can avoid it. HKEY_LOCAL_MACHINE -> SOFTWARE -> Python -> PythonCore -> [ Version Number ] -> PythonPath. 4.-Make right click and select create new Key / Crear una nueva clave. Call it anything, I called mine DjangoPath. 5.-It will generate a file without value. Double click on it and add the directory where Django is installed as show in the figure. 6.-Make click in OK / Aceptar and close the application. Now after you type import django in the console it should be recognized.